It’s been a month since Android 8.0 Oreo begun rolling out to select devices. Given its debut on Nexus and Pixel devices, the latest version of Android has finally shown up on October’s Android Distribution chart. Currently, Oreo is running on 0.2% of total active Android devices. Meanwhile, Nougat continues its streak to rise as older versions remain static or diminish. Last month’s (September) Android distribution chart had no mention of Oreo, but October release has finally got it listed. Currently, only devices from Google and Sony are running Android 8.0 Oreo. Sony Xperia XZ1 already runs Oreo while the XZ1 Compact is also expected to ship with the latest version of Android. Google’s Pixel and Nexus devices are also running Oreo. The share of Oreo is expected to grow in the next distribution chart as Google will launch the Pixel 2 lineup. Also, other manufacturers are also gearing up to launch latest devices with Oreo on them. According to October’s distribution chart, Android 7.0 Nougat rose by 1.6% to 15.8% while Android 7.1 Nougat saw an increase of 0.4% to 2.0%. When combined, Nougat now runs on a total of 17.8%, which is registers a rise of 2% from September’s distribution tally. Meanwhile, Marshmallow fell by 0.2% and is now accounting for a total 32.0% of active Android devices, but it is still the most used version of Android. 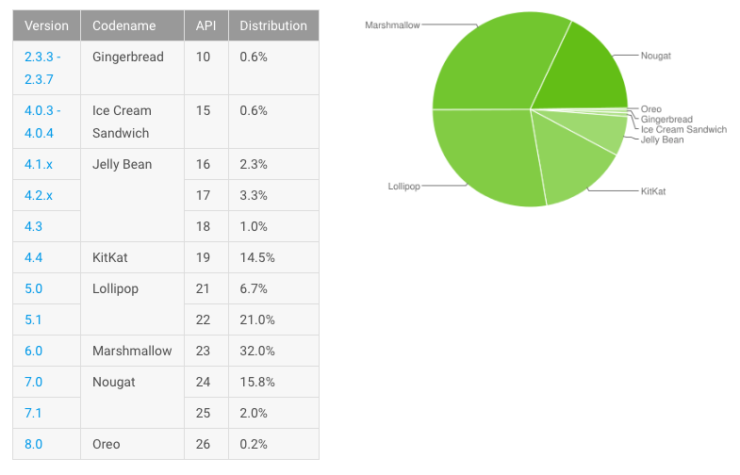 Android 5.0 Lollipop runs on 27.7% devices while Android KitKat marks 14.5%. Older versions like Jelly Bean fell to 6.6% as Ice Cream Sandwich, and Gingerbread both remain static at 0.6%. The data for every month’s Android distribution chart is compiled from Android devices that accessed the Play Store during a seven-day period ending on October 2, 2017. The fact that Oreo is still at 0.2% regardless of the update rolling out to Pixel and Nexus devices is because these phones occupy less than 1% of the Android smartphone market share. This is the reason why continued updates for these phones don’t make a big difference on the distribution chart. Also, Nougat has still not crossed 20% on the chart, which speaks volumes about how slow the update process is for other phones.